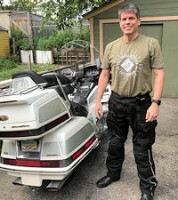 I have a 2015 Goldwing. I recently purchased and installed both the front Pathfinder and rear Sentinel Passenger Armrest sequential directional lights. I also have the factory spoiler with run/turn/brake upgrade light. The front lights are fantastic. The instructions were clear. The installation was straight forward. They match and look good on the bike and they show up very well in traffic. I couldn’t be more pleased. The rear lights are great in theory. The opaque lens is disappointing compared to the front directional or the spoiler light. Works and visible just not as bright as I hoped and don’t match the other lights. More annoying though, the mounting method is ineffective. Very poor and not up to standard. The shape of the lights provide little tolerance or flex and the two sided tape is not strong enough to overcome any shape variation between the light and the speaker housing. I have been forced to reattach mine several times using different brands of two-sided tape. On multiple occasions I have looked in the mirror to see them dangling and flopping, forcing me to stop and temporarily hold them in place by wrapping electrical tape around the lights, the speaker housing and the armrest. Most recent attempt was use of 3M emblem glue. This stuff is like model glue and will melt some plastics so I knew this meant that if they come off again, the speaker housing will likely be deformed meaning I will not be able to just remove the lights completely without replacing the housing. So far after a couple days and a few hundred miles, they are still in place (knock on wood). Next step if this fails will be to screw them in place and use the snap on screw covers to cover the screw heads. Too expensive to have this much trouble especially compared to the front lights which are the same price. Re: Add-On Sentinel rear running/brake/turn signal lights. I used to have all kinds of problems with double-sided adhesive tape until I came across 3M VHB (Very High Bond) tape. It's a closed-cell foam double-sided tape with incredibly strong adhesive. Once I stick something on my bike with it, it is not moving - yet it can be removed with no residue if you need to. Thanks. I have ordered some and will try it. It does look a lot like the Norton brand automotive mounting tape which I have had great success with over the years. Great stuff which unfortunately failed me in this application. Lasted longer than any of the others but a day in the direct sun, bouncing around the back roads and the tension in the light was enough to start pulling away from the speaker housing. Regular 3M was not helpful. Neither was Gorilla two side tape. I might have to try the Flex Seal and if I order in the next ten minutes they'll double the order for a small processing fee. Even if it doesn't fix this it will glue the two halves of my boat together. Thought I should give an update. I ordered the VHB tape but never got to use it. I used the 3M brand PLASTIC EMBLEM ADHESIVE part# 08061. This stuff has very high VOC - use in a well ventilated area! It is solvent based and can damage some plastics. Try it on a small hidden area if you can. I masked off everything I could. I cleaned off all the previous tape and wiped everything twice with alcohol. The instruction say to put some on one side, touch the two pieces together, pull them apart and wait half a minute before pressing them together and clamping. I did this except while the two were back apart I added more adhesive to the bare spots I could see. I had gone light at first because I didn't want any to squeeze out. These are a bear to clamp. I was able to get some clamps tucked in between the passenger backrest side bolsters and the speaker housing and then clamping to the outboard side of the speaker housing. There is no way to clamp the narrow piece that extends over the top so I had preplanned this job for a day when "you know who" wasn't home and borrowed two five lb bags of flour from the kitchen. So that was five weeks ago and they are still in place and tight. Hope I didn't jinx myself. Many miles on rough roads and some bright sun/high temp days. Fingers are crossed. I also bought some short screws with black snap on covers as the ultimate fix just in case.